After a rugged debut EP for Hospital Productions in 2014, London's Shallow Sanction up the ante on Without Light. Two anthemic tracks of misanthropic, boot-stomping deathrock that mix the dramatic lurch of Killing Joke, Part 1, and Christian Death with the primitive attack of The 4-Skins, Rudimentary Peni, and early Blitz -- so in case you were wondering if that strange mix was ever a thing, it is now. Features extra synth and electronics by Zen Zsigo/Cremation Lily. Limited to 250 copies. "Debut release from London's Shallow Sanction. A refreshing but authentic take on the lineage referencing bands such as early Christian Death, Amebix, and Conflict. 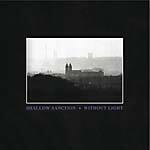 Shallow Sanction rejects the otherwise 'in the red' and overly distorted approach of recent years for a more honest, stripped down and raw gothic punk sorely missing from many of their contemporaries. An aggressive, 'only man left' feel runs through the EP. An isolated and anthemic voice echoes along cold rainy drums and bloody nose bass, accented by the unusual introduction of effects and smartly placed electronics along the way in an otherwise skeletal and frightfully nuts and bolts morbid punk sound. Shallow Sanction evokes a nihilistic, apocalyptic, youthful, urban mentality set in old London coiling in on itself. Edition of 300."